For the past two years I have been predicting that M2M (machine to machine) communications will eventually become important and ultimately merge with enterprise mobility. Why? 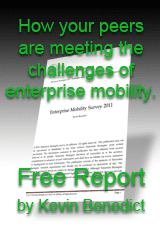 Both involve remote and often mobile sources of data coming into the enterprise. A few weeks ago, SAP made an announcement about M2M that I think is very interesting. Here is an excerpt, "SAP today launched a new machine-to-machine (M2M) resource center with the Economist Intelligence Unit (EIU). The site features research and opinion from SAP, the EIU and other partners exploring successful M2M business models and scenarios." I have also seen press about SAP's Mike Wendell, VP Industry Solutions, speaking at various conferences on the topic of M2M recently. In addition to reports, SAP has begun to partner with M2M solution providers like, ILS Technology. In fact, ILS Technology is at SAP's SAPPHIRENOW 2012 this week showing their M2M solutions. Here is how ILS Technology describes what they do, "Our M2M Application Platform interfaces directly with SAP and other backend systems. That way, SAP users can leverage the information from their M2M connected devices for better business intelligence." The next question, however, is why would an SAP user want an M2M solution? Here is how the introduction to the SAP/EUI report describes it, "The promise of a world of connected devices, in which machines of all types and sizes can autonomously communicate with each other, has long been imagined. GM’s OnStar business, which provides a growing range of in-vehicle services, has been around for some 17 years. But the past year has seen a surge of interest around the core enabling technology of the connected world: machine-to-machine (M2M) communication. Much of this interest stems from mobile operators, who are eagerly awaiting the possibility of connecting cars, homes, equipment, heart sensors and all manner of other devices to their networks to find new revenue sources." Here are some additional thoughts on how M2M solutions may be relevant to SAP and other ERP users. Information on assets, vehicles, equipment, location, product configuration, health status, usage, inventory levels, security systems, and alerts can wirelessly update ERP systems. This M2M data can trigger business process workflows such as automated service ticket/case creation, pay-per-use billing, warranty management, replenishment of consumables, compliance management, product recalls, planned maintenance and more. The M2M report, commission by SAP, can be found here.